While the MWC 2018 does not start officially until tomorrow morning, many manufacturers took advantage of the weekend to announce their new products. Samsung, for example, unveiled its new Galaxy S9 and S9+ at its Unpacked event. This year, the world's leading manufacturer played it safe, simply improving the technical characteristics of its Galaxy S8. Yet, I was hoping to see something more daring from Samsung. So here are 3 things that I think the new Galaxy S9 and S9+ lack. Is the Galaxy S9+ really so different from the Galaxy S9? Needless to say, the new Galaxy S9 and S9+ that have been introduced tonight look like great smartphones. But beyond the hype, are the Galaxy S9 devices so good? Without a doubt. However, they are not perfect for everyone, and I find them to be lacking in some critical ways. Maybe it's just me, but the presentation of the new Galaxy S9 didn't excite me at all. Samsung may have improved the photo potential of its smartphones, opted for stereo sound or changed the position of the fingerprint reader, but I didn't feel any real 'wow' effect. No major functionality. Unsurprisingly, the Galaxy S9 has continued with the attractive design of the Galaxy S8 but no changes have been made. Unlike last year, smartphones are unlikely to generate "aaaah","oooh" and "wow!". The new position of the fingerprint reader can't convince me either. Above all, it masks the absence of a fingerprint reader under the screen. Although expected with the Galaxy S9, this type of fingerprint reader did not finally come into being, as Samsung probably decided to remove this functionality and opt for a traditional fingerprint reader at the back of the device. The South Korean manufacturer would indeed encounter some technical problems with this technology. The performance of the components for this sensor would not be very high. The mobile phone giant did not want to take any risks and would prefer to keep this novelty for its Note 9 phablet rather than for its Galaxy S9. 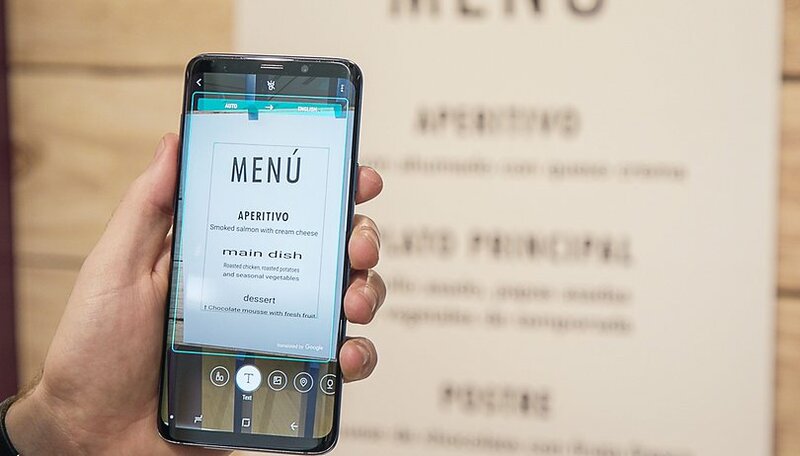 Bixby Voice, Samsung's digital assistant, which was presented with great fanfare last year and again evoked during the presentation, is still only available in a few languages (Korean, Chinese and English). Alright for a lot of people, fine. But as Google Assistant is busy training to be a universal translator, Bixby will seem increasingly provincial and uneducated in the company of other more cosmopolitan voice assistants. Admittedly, it's only a matter of time before Bixby learns more, but poor Bixby is struggling to keep up while other voice assistants make their mark, and then there's still that annoying physical button. Why is Bixby so slow to learn? This would be a Big Data problem: it needs much more data in its reserve. It is only through the available data that the machine learning system can work: the more data it has, the more it can learn (and more quickly), which then adds new data, and so on. This problem of lack of data is undoubtedly linked to the slow development of different languages, but we do not have real concrete details on the why or how. There too, Samsung has remained relatively silent on the subject. No revolution has been announced in the field. The Galaxy S9 and S9+ quietly pick up the batteries of their predecessors, namely 3,000 and 3,500 mAh respectively. It's a disappointment for me. In terms of battery life, the Galaxy S8 never proved to be the best student in the class. Even if they were not the worst, they often needed to be recharged during the day in case of heavy use. Armed with equivalent batteries, the Galaxy S9 will not be able to last indefinitely because of the various greedy components that make it up. It will certainly be necessary to play with the definition of the screens to prolong the battery life of the smartphones and switch back to the default setting, i.e. Full HD+. That's a real shame for a modern flagship. What do you think is missing from the new Galaxy S9 and S9+? Let us know in the comments! Coming from the S7 I miss the ability to hotspot AND stay connected to wifi. Often my phone would have the wifi details but my iPad did not. Now I have tohave mobile reception for it to work (I often dont). Also my account got updated to VoLTE last night without asking and today my calls keep dropping out or dropping to no speech. There is no setting option on my S9 for VoLTE! I had to get the carrier to turn it off so I could actually use my phone. I'm hoping for better battery life in upcoming phones too. Apart from removable batteries, it's the thing I want to see most in the coming years. I agree with Rusty H. There is no wow factor in phones any more, it is all gimmicks and hype. About the only thing that will get me wowing over a new phone is a removable battery. With todays processors there is no need to buy a phone every 2 years. A 4 year old phone like my Note 4 still runs everything. That is why they gone with sealed phones to force you into buying a phone every 2 years. Until they bring back the removable battery I will keep buying old phones. Where is the "wow" factor? That could be said about 99% of the entire smartphone industry. They've been stuck in a slump for the past few years. What do we get? Gimmicks, faster processors, brighter displays, slight camera improvements ,for what? Sky high prices? If you look at the build costs versus the retail price, they are way out of line for most consumer electronics, which, over time, get improvements, but less costly. Now that it appears that the "peak" smartphone sales have been reached, and, it also appears that consumers are starting to tire of the high prices, either innovation, or less expensive phones will have to come along. Regardless of the price point, there's not enough wow factor for even this highest of the high-end devices in the past few years. As smartphones are becoming commodities, the excitement is fading.